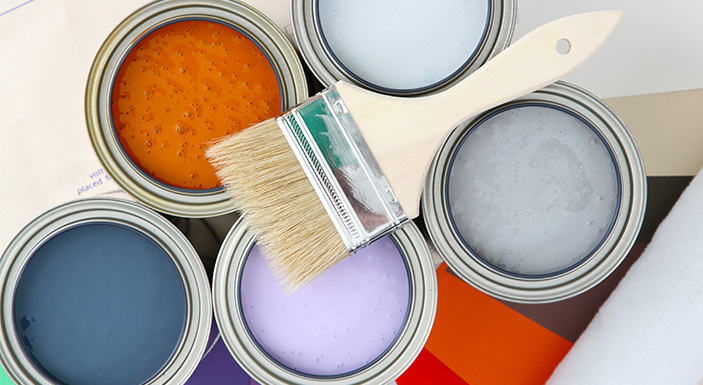 Whether you are a new Gainesville homeowner, a 15-year resident looking for a quick, inexpensive home update or even if you are looking to sell your home soon, chances are you’ve considered repainting a room or two. A new coat of paint in your house gives it that fresh, new lease on life your home may need – or catch the eye of a potential home buyer. But where do you begin? Walk into any home improvement or paint supply store and the choices are staggering. Try to go neutral with a tan shade from Behr and you’ll choose from Translucent Silk, Espresso Martini or Cinema Screen? Lighten up with a white from Benjamin Moore and select from Oxford White, Steam or perhaps White Zinfandel? Or brighten up with a blue from Sherwin-Williams and that might lead you to Perfect Periwinkle, Gultstream or even Bosporous (yes, a real paint color). Color choices are endless … where do you even begin? And when trying to paint and coordinate the colors of multiple rooms in your home? Just forget it. But this year, Sherwin Williams has introduced a personal but professional touch to coloring your home. With In-Home Color Consultation, Sherwin-Williams offers customers a 90-minute personal home consultation with a trained color specialist. “People have such an emotional response to color and are just afraid to commit,” says Gainesville resident and Sherwin-Williams Color Consultant Amy Milani. Amy has worked with many Gainesville residents to help personalize their home color choices from new home owners to retirees putting the finishing touches on their dream home to homeowners simply looking for a fresh new look. “I approach every project to individually tailor it toward each homeowner and their end goals. Your home should be a retreat, a refuge at the end of the day and sometimes color can make all the difference,” says Milani. Color Theory 101 she says, outlines three dimensions of color she works through with and for her customers: hue involves picking the right color; saturation determines the level of intensity or brightness of a color and value indicates the lightness or darkness of the shade. Every ColorSnap® In-Home Color Consultation (total cost is $95) includes the following: a $50 gift card for any Sherwin Williams paint and supplies, a pre-consultation phone call which will start the process to customize your selection, and a full supply list that you will need for any project discussed during the consultation. Finally, you’ll also receive a coupon for a buy-one-get-one free color sample to get you started. Sherwin Williams has three locations in the Gainesville area including NE 23rd Avenue, SW 34th Street and W. Newberry Road in Newberry. It’s your home … color it!